This page is identical to the old website but the Monthly Parties page has been changed. 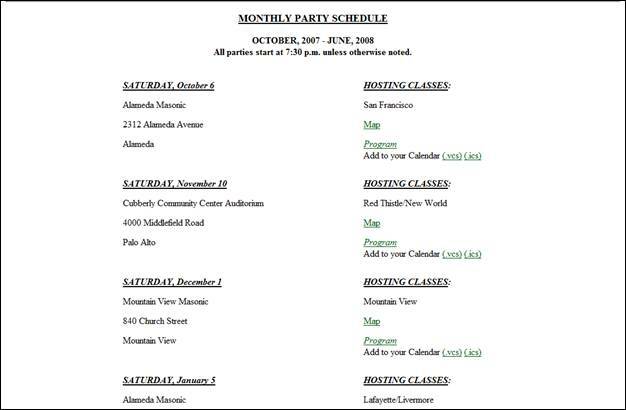 Clicking the Party Schedule link will take you to the Monthly Parties page. This page is almost the same as on the old website. The monthly parties are stored in the database with other events. This page lists the monthly parties that are in the future. The Map link with each party entry will open a Google map for the party venue. The Program link, if active, will open a window with the party program. The link is active if it is underlined. The Add to your Calendar is for people using a computer based calendaring application. Click either the . vcs or the . ics link to add the party to your calendar. If you are using a Windows PC, try the . vcs link first and if you are using a Macintosh, try using the . ics link first. The ics format is the newer standard and will eventually replace the vcs format. Microsoft Outlook supports both formats.